1 of 3 Heat large nonstick skillet over medium-high heat. Coat with cooking spray. Add beaten eggs; cook without stirring for 2 minutes, until flat omelet forms. Remove to large plate. Cut into 1/2-inch wide strips. Wipe out skillet. 2 of 3 In same skillet, heat vegetable oil over high heat. Add onions and red pepper; cook 8 minutes. 3 of 3 Add soy, oyster sauce, garlic powder, ginger, pepper flakes, rice; stir-fry 3 minutes. 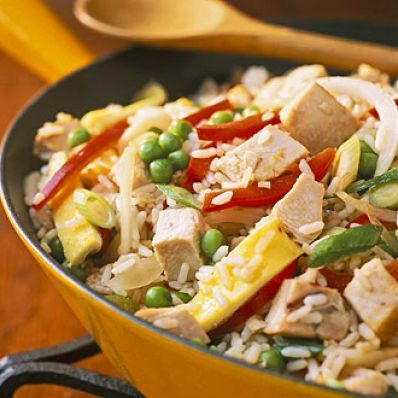 Stir in sesame oil, scallions, peas, water chestnuts, turkey, egg strips; heat through over medium heat, stirring, 2 minutes. Makes 6 servings. Per Serving: 4 g sat. fat, 177 mg chol., 19 g Fat, total, 694 mg sodium, 6 g fiber, 42 g carb., 36 g pro., 487 kcal cal.